This edition the MMAniacs broadcast live from CES MMA 45, which took place Friday August 11, 2017. 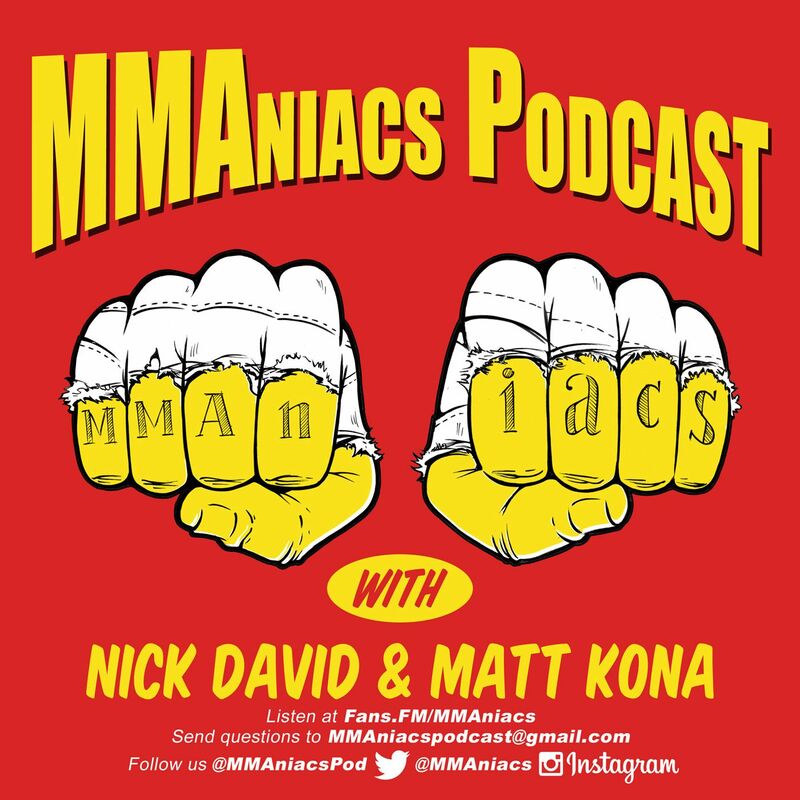 As always, hosts Matt Kona & Nick David give their unique perspective on MMA and call this event live as it happens. The main card features two world-title bouts, including the long-awaited return of reigning CES MMA Heavyweight Champion Ashley Gooch (10-5, 7 KOs) defending the strap against fan-favorite Juliano Coutinho (7-3, 3 KOs), plus longtime regional stalwarts Saul Almeida (19-8, 1 KO) of Framingham, Mass., and Pedro Gonzalez (11-5) of nearby Gloucester battling for the promotion’s Interim Featherweight World Title. In a highly-anticipated regional showdown that could steal the spotlight Aug. 11th, rising lightweight star Nate Andrews (10-1, 5 KOs) of East Providence, R.I., puts his four-fight win streak on the line against Maine native Bruce Boyington (14-10, 8 KOs), a veteran of 24 professional fights and a three-time WSOF vet. Also on the main card, Cranston, R.I., welterweight Gary Balletto Jr. makes his television debut against Hooksett, N.H., vet Nick Alley (3-1, 1 KO). Balletto carries a three-fight win streak into next month’s bout, most recently dismantling Chris Torres by first-round submission on the preliminary card of “CES MMA 42.” Unbeaten Milford, Mass., bantamweight Kris Moutinho (4-0, 1 KO) battles Erie, Pa., native Brandon Seyler (6-5-1, 1 KO), who makes his second appearance with CES MMA. Moutinho is off to a flying start as a pro with wins in all four of his bouts under the guidance of CES MMA, including an impressive unanimous decision win over seven-fight vet Lloyd Reyes at “CES MMA 42.” Highlighting the preliminary card, 20-year-old Providence, R.I., native John Doumaagainst Jason Rine (0-2) of Danville, Ohio, following wins in each of his last three amateur bouts. Ludlow, Mass., lightweight Leon Davis (8-3, 1 KO) returns to face Andrew Osborne (7-10, 2 KOs), the two-time CES MMA vet and North Carolina native who now lives and trains in North Providence, R.I. Osborne comes off an upset win over previously-unbeaten Connor Barry by unanimous decision at “CES MMA 43” while Davis, a winner in his last four fights, makes his seventh appearance with CES MMA. Also on the preliminary card, unbeaten featherweight Dylan Lockhard (3-0) of Hollis, N.H., faces Cortland, N.Y., vet Ahsan Abdullah (7-7, 3 KOs). Lockhard earned his first two wins as a pro under the guidance of CES MMA, including a first-round submission win over Russell Campbell at “CES MMA 40” in November. Visit www.cesmma.com, www.twitter.com/cesmma or www.facebook.com/cesmmafor more information, or follow CES MMA on Instagram at @CESMMA.